Советские мотороллеры Forums-viewtopic-Production Figure: How much Vjatkas in which year? Production Figure: How much Vjatkas in which year? Добавлено: Сб Мар 01, 2008 6:19 pm Заголовок сообщения: Production Figure: How much Vjatkas in which year? I was collecting some informations about the production of Vjatka modells. But I have still empty lines in the list. Who knows more details? I'm afraid, but nobody from us didn't have any so detailed information. But who knows, we will see. I was collecting those information over one ore two years from a lot of different sources. Sources like, for example: Magazines ( http://www.scootering.com , http://www.motociclismodepoca.it, ...) or from the internet from different pages. Do you collect such information only about motorollers? I only collect information about the Vjatka production. And it's just because I found something and I was thinking it's interesting to find out more. For me it's also a little "challenge" to know the most things outside of the earlier Sovjetunion. For example, for Vespa existing a lot of lists on a lot of web sites. Guten morgen her "foifi". Ich habe kleine informazionen fur sich. Ich verschteer und schpreheer, aber meine Deutch ist zo zo la la. Meine Englisch ist nicht schlecht. Zo alzo, Here in Russia there have been a popular magazine called " At a Steering Wheel". This is the only magazine of this type in the Soviet Russia. It has been published from fifties. 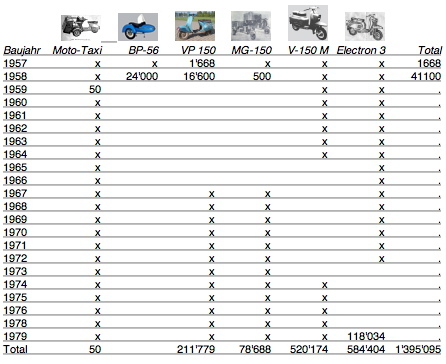 It has been about different types of vehicles including motoes mostly about Soviet ones. As it was published in Soviet Russia, it had some propaganda of course. And I remember there was information published several times in different years about vehicles produced, how many of them, and what modifications they had during a certain time period. There were motorollers as well. Here is an example of a page of this magazine issued in in 1969. This magazine is still alive. It changed, and has much commercial in its pages now, but this is the only one I would trust. Nowadays there exists a pretty much popular magazine with name "Moto". It has been produced by the same publish company, and in the articles about antique motor vehicles it repeats " At a Steering Wheel" magazine , Try to find in the Net old issues of " At a Steering Wheel" published in 60-70s years. We have them in the state libraries. Other new Russian magazines I wouldn't trust to at all.